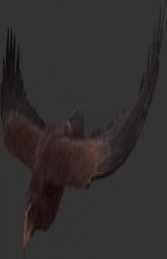 A flying model of a Wedge Tailed Sea Eagle, will make the most realistic crow scarer, add the perfect finishing touch to any animal themed area, or as a stand alone piece to promote your bird seed! This distinctive Wedge Tailed Sea Eagle is extremely realistic, with its iconic eagle eyes, razor sharp beak and needle like claws! The Resin model comes complete with the transparent wire attached to the Eagle’s back so would be easy to suspend from the ceiling to create that perfect scene. This is sure to be a hit with the Twitcher’s amongst us.